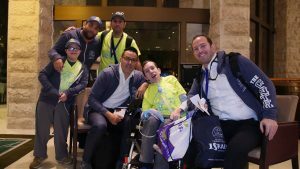 When Yaakov Shwekey brought Eli, a bar mitzva boy and a few of his friends from The Special Childrens Center to Israel to celebrate his Bar Mitzva he never dreamed he would have to step in and help Eli fulfill his obligation on this momentous occasion. 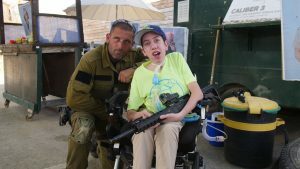 Yaakov’s wife Jenine along with her friend Chaya Bender have an organization for special needs children and along with an anonymous donor they fullfilled these childrens dreamed of seeing Israel for the very first time. Along with their parents they all left joyfully for a week of their dreams. Unfortunately the day before the bar mitzva Eli’s grandfather was niftar and his father was no longer able to celebrate this momentous occasion with him. 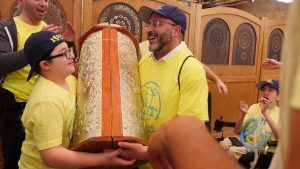 Yaakov, doing what he always does for these children stepped up to the plate and made this day the most magical day that will be remembered for eternity.